The armament or battery of warships is divided into two classes, called respectively, the main and the secondary batteries. 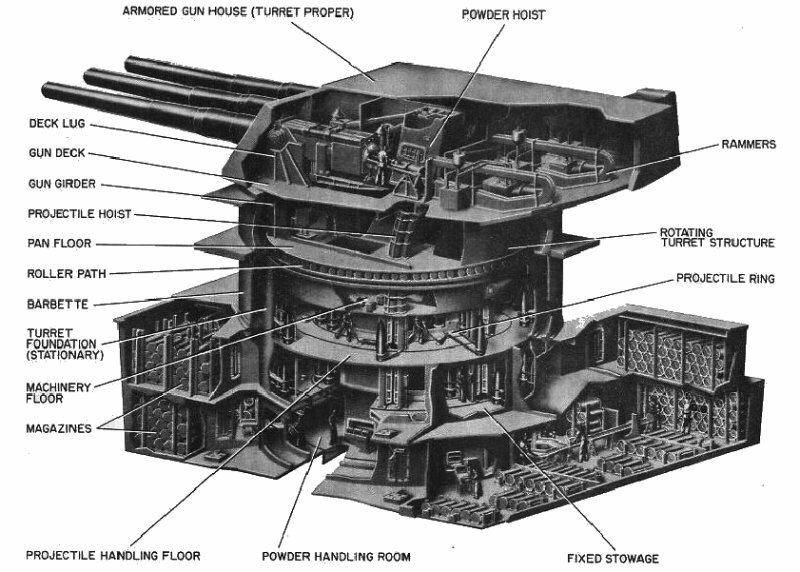 The main battery comprises the heaviest guns on the ship, those firing large shells and armor- piercing projectiles, while the secondary battery consists of small rapid-fire and machine guns for use against torpedo boats, or to attack the unprotected or lightly protected gun positions of an enemy. The turret was common to the cruiser, the monitor, and the battle ship, and was initially a circular steel tower with openings called portholes through which guns project. The turret was the strongest feature of the original monitor and was desirable because it placed the heavy guns over the center of the ship, where they least disturb the balance and can be protected with less weight in armor. A gun in a turret is equal to a gun on either broadside and all economy of weight thus gained can be used to give better armor protection to the ship or more powerful engines giving higher speed. Several Powers followed in Ericsson's footsteps by building turret ships of various patterns, and within a couple of years there had been set afloat two vessels which were a closer approach to the modern dreadnought than anything built between 1865 and 1905. These were the American Roanoke and the British Royal Sovereign.The former was given three and the latter four center-line turrets. In the British navy an attempt was made later to combine the turret system with full sea-going and sea-keeping qualities, but it was not altogether successful. In the 1870s the air within the turrets was so vitiated as to be unfit for respiration, and had not a portion of the turret roof been continually lifted it is probable that the air would have soon become so bad as to render it uninhabitable. The consequences attending such a state of affairs during the heat of an action, when it would be most likely to occur, are sufficiently obvious. The remedy is evidently found in the entire removal of the roof, and firing the gun over the top of the tower instead of through a port-hole. In that case a complete circle of range can be obtained without moving the turret itself. This is, in fact, the barbette system that may be said to have reached its climax in the British battleship Benbow, in which a 110-ton gun was mounted on the top of a tower at either end of the superstructure. During the 1880s most of the naval Powers took a sudden dislike to the closed turret, and in its place was adopted the open-top barbette. This system had many advantages - it saved a good deal of weight and enabled the guns to be placed at a higher level than was possible with the heavily-armored turret; but, on the other hand, the breech end of the guns, and the guns' crews, were left entirely unprotected. It was curious that the introduction of the efficient quick-firing gun coincided more or less with the appearance of the open barbette, and, not unnaturally, quickly put an end to it. The barbette, however, did not entirely disappear, but there was devised a convenient half-way house between it and the turret. This was at first known as the hooded barbette. It retained to some extent the protection which the closed turret afforded to the guns' crews, while it also had the advantage of the protected base, a feature that was missing in most of the early turret-ships. Hooded barbettes came after a time to be referred to simply as "barbettes," but soon it was the universal custom to call them "turrets" - and they certainly had more in common with Ericsson's invention than with the open-top gun-house. The barbette tower dispensed with revolving machinery, steam-engines, and other details involving weight, and therefore avoids taxing the vessel's carrying powers by a considerable amount. The tower need not be much over a man's height, and, provided its diameter is not great, will require no other roof protection than a bullet-proof screen, which may be raised several feet above the top of the towers. Indeed, as a general rule, these screens may be dispensed with, for it can only be when in close action with a rigged ship that they would be needed. Another advantage of the barbette system is found in the fact that with it there is no such danger possible as that of the turret becoming jammed by a shot, nor were there points of discontinuity, and therefore weakness, in the wall of the barbette such as exist at the port-holes of the turret. In most barbette ships built prior to 1890, whether English or foreign, the barbettes were shallow armored cylinders with plated bottoms, standing on light steel structures at a considerable height above the belt deck. Armoured tubes have been fitted to protect the ammunition when it is passed up from the magazines into the barbettes. This system greatly economised weight of armour, but the development of high explosives makes it possible that shells containing bursting charges of great energy might be exploded immediately under the floors of the barbettes. At the beginning of the 20th Century the main battery usually consisted of four 10-inch, 12-inch, or 13-inch breech-loading guns, mounted in pairs in revolving barbette turrets, one forward and one aft, on the center line of the ship. Occasionally these guns were mounted en barbette, that is, the gun projects over a circular wall of armor, without the revolving turret or hood; it is not uncommon also, in foreign navies, to find but one gun in a turret or barbette, and sometimes these turrets or barbettes, instead of being placed on the center line of ship are en echelon, that is, the forward one on one side of the vessel, the after one on the opposite side. The barbette was a steel tower intended to protect the heavy rollers on which the base of the turret rests, the machinery for turning it, the guns within the turret, and all the machinery connected with them. The guns look out over the top of the barbette and, in most battle ships, it extends down to the protective deck. 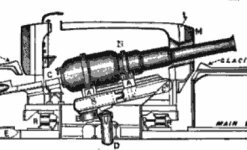 Within this, like a smaller tube within a larger one in a spyglass, is placed the turret, mounted on heavy rollers, with suitable machinery for turning it. The barbettes show plainly in the pictures of many battle ships, and look like large hoops encircling the turrets at the base. Only the heavy guns of a ship are placed within turrets. The barbettes, one forward and one aft, about over the magazines, rest upon the protective deck at the bottom and extend up about four feet above the upper deck. At the top of the barbettes, revolving on rollers, are the turrets, sometimes called hoods, containing the guns and the loading mechanism and all of the machinery in connection with the same, and the turret ammunition hoists lead up through the barbettes from the magazine below, delivering their load of charge and projectiles at the breech of the guns in position for loading and, as they pass up inside of the barbettes and turrets, they are as well protected as is possible. The heavy guns are placed within the turrets. The turret is common to the cruiser, the monitor, and the battle ship, and is a circular steel tower with openings called portholes through which guns project. It rests on heavy rollers and is made to turn by machinery so as to point the guns in any desired direction. The turret was the strongest feature of the original monitor and is desirable because it places the heavy guns over the center of the ship, where they least disturb the balance and can be protected with less weight in armor. A gun in a turret is equal to a gun on either broadside and all economy of weight thus gained can be used to give better armor protection to the ship or more powerful engines giving higher speed. Electricity is the motive power most commonly used to rotate the turrets. Electricity, steam, or hydraulic power supply the force required to move the guns and the machinery of the turret. 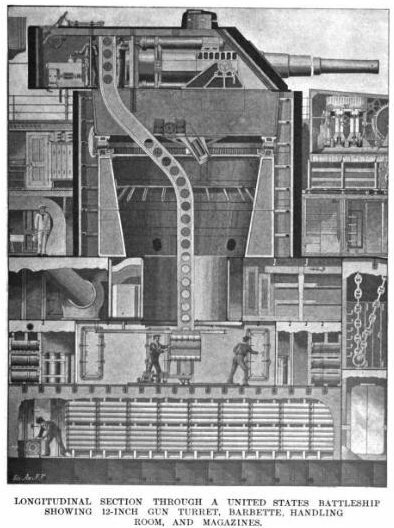 Since powerful shells exploded underneath the turret would injure the mechanism, it is desirable that something like a gigantic steel tube, or well, with walls of heavy armor, reach from the base of the turret to the protective deck, to protect the machinery and furnish a safe passageway for the ammunition from the magazines below the protective deck underneath the water to the guns above. Within each turret are usually placed two heavy guns which are moved by machinery. It was the almost universal practice to place the four heaviest guns in pairs, in revolving barbette turrets, on the center line of ship. In addition to these heavy guns it was usual to mount a number of smaller guns, from 5 to 8 inches diameter of bore, on each broadside, though often the 8-inch guns were also mounted in turrets. A battery arrangement that obtained to a considerable extent was to have four smaller turrets, each containing two 8-mch guns. These turrets were arranged in a quadrilateral, two on each side, the forward two somewhat abaft the forward large turret, and the after two forward of the after large turret, with in addition to this, a number of 6-inch or 7-inch guns mounted on the broadside. Later this arrangement waas been somewhat changed by superposing one of the 8-inch turrets on each of the large turrets, the other two in some cases being placed one on each side of ship about amidships, while in other cases they were omitted entirely, their place oeing taken by a greater number of broadside guns. The Indiana, the first American battleship, had the two large turrets referred to, each containing two 13-inch guns, the quadrilateral arrangement of four turrets each with two 8-inch guns and two 6-inch guns on each broadside. Next came the Iowa with a somewhat similar arrangement except that 12-inch and 4-inch guns were used in place of the 13-inch and 6-inch guns respectively. She was followed by the Kearsarge class, with 4 13-inch guns in turrets, arranged as before, with a turret mounting 2 8-inch guns superposed on each 13-inch turret, and with a broadside battery of 14 5-inch quick-fire guns. Next came the Alabama class, with 4 13-inch guns, in the large turrets, no 8-inch guns at all and 12 6-inch guns on the broadside. 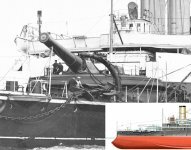 After the Alabama class the 13-inch gun disappears, and in the Maine class, which followed, there are 4 12-inch, no 8-inch and 16 5-inch quick-fire guns. The Virginia class shows a return to the 8-inch gun, her armament being 4 12-inch, 8 8-inch and 12 6-inch guns. 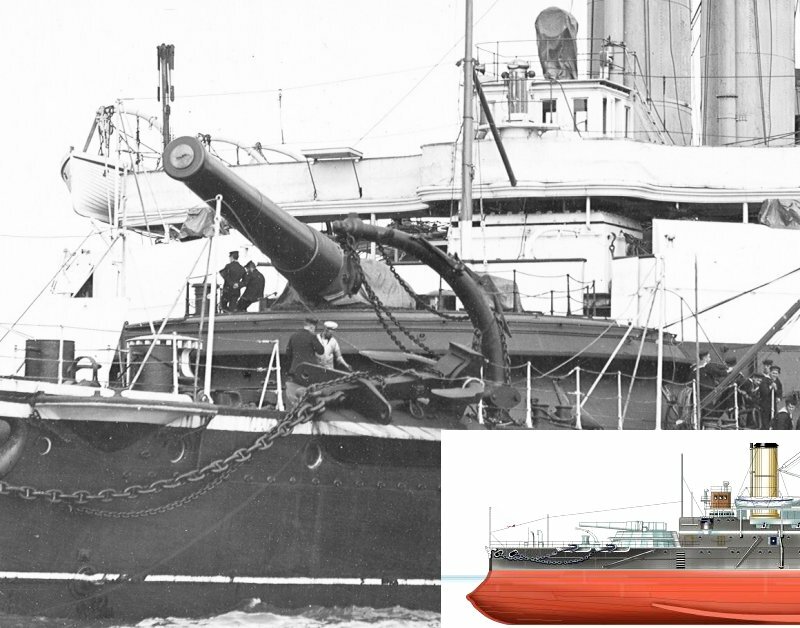 On the Connecticut and Vermont classes there were 4 12-inch, 8 8-inch, and 12 7-inch, the latter being a new gun used here for the first time. The Mississippi class had 4 12-inch, 8 8-inch and 8 7-inch guns. On the Connecticutt class, commencing at the bottom of there is the outside plating of the ship; then about four feet above that is the inside plating, or inner bottom, as it is called. This space is divided laterally by the frames of the ship, which run across the bottom and up the sides to the shelf, upon which the side armor rests. Upon the double bottom, and between that and the first deck above, is a magazine where the ammunition is stored in racks, this particular ammunition being for the rapid-fire guns of six-inch caliber. On the deck above and centrally below the turret is located the handling room into which open by water-tight doors the magazines, where are stored the powder charges and the shells for the 12-inch guns above. Two decks above is the steel protective deck, 2-1/2 to 3 inches in thickness. Upon this deck is erected a great circular structure known as the barbette, whose walls will be from eight to twelve inches in thickness. The barbette is actually a circular steel fort, and it is thick enough and its steel protection hard enough, to break up and keep out the heaviest projectiles of the enemy, except when they are fired at close ranges. At about two- thirds of the height of the barbette is a heavy circular track upon which runs a massive turntable. The framing of this turntable extends to a point slightly above the top edge of the barbette, and upon it is imposed the massive structure of the turret, which is formed, like the barbette, of heavy steel armor carried upon framing, the form of the turret in plan being elliptical. The front face of the turret, which slopes at an angle of about 40 degrees, is pierced with two ports, through which project the two heavy 12-inch guns. The mounting of these guns is carried also upon the turntable and revolves with the turret. From the handling room below a steel elevator track extends up through the barbette and curves back to the rear of the gun ; and upon this there travel two ammunition cages which are loaded below upon the handling room floor and carry the projectiles and powder up to the breech of the guns, where it is thrust into the gun by mechanical rammers. The ships of the Iowa class were the last battleships built by the United States. In addition to the U.S.S. Iowa (BB-61), the class includes the U.S.S. New Jersey (BB-62), the U.S.S. Missouri (BB-63), and the U.S.S. Wisconsin (BB-64). The ships were originally commissioned between 1943 and 1944, were in active status during both World War II and the Korean conflict, and were decommissioned by 1958. Except for the New Jersey's short recommissioning during the Vietnam conflict, no battleships were in active status for almost a quarter of a century until the New Jersey, the first of the four to be reactivated, was recommissioned in December 1982. The ships' principal armament, as built, was a main battery of nine 16-inch guns. Three guns are mounted in each of the three turrets. The guns, using several types of powder, fire a variety of projectiles that weigh up to 2,700 pounds and that have ranges in excess of 23 miles. The powder for the 16-inch guns is contained in silk bags. Six bags are the standard charge to fire a projectile. Each bag of the type of powder involved in the Iowa explosion contained about 94 pounds of propellant pellets. These pellets are stacked vertically in the bag in eight layers. Each bag also contains a trim layer that consists of a variable number of propellant pellets placed horizontally on the top layer of vertically stacked pellets when necessary to standardize the weight of the charge. Additionally, a pad containing black powder is sewn to the base of the bag. The powder bags are transported and stored in metal containers-three bags per container. The bags are removed from the containers prior to firing and are loaded into a gun separately from the projectiles. Both the projectiles and the powder are loaded into the 16-inch guns using an electric-hydraulic rammer mechanism. The projectile is loaded first, after which the powder bags are loaded. A crew member, responding to hand signals from the gun captain, controls the speed and length of the ram with a manually operated lever. Projectiles are to be rammed at a speed of about 14 feet a second, while the powder charge is to be rammed at about 1 to 2 feet a second. When a gun is fired, the black powder of the bag closest to the breech block is ignited by the primer, which ignites the propellant.